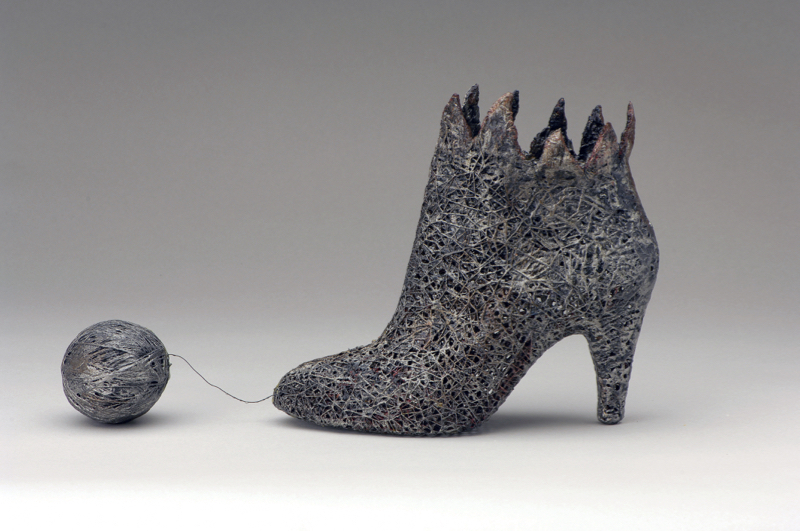 Fiber and mixed media crocheted shoe with yarn ball attached. Willow and wax linen. Attached in moveable sphere. 2017. Willow and wax linen. Torso attached. 2017. Art: 7.25" x 5.75"; Frame: 15.25" x 13.5" x 1"
Cedar bark, wire, yellow cedar outer bark border. 2017. Six suspended flame treated stainless steel mesh works with colored silicone. 2017. 23” x 25” x 2.5"
6 5/8"x 8 3/8"x 5/16"
Gourd, heat transfer on rice paper, laminated. 6 7/8" x 5 5/8"
Digital jacquard textile, polyester. 2017. Woven pine needles, Japanese paper, paint, Japanese brushes. 2017. Vessel woven in exposed pine needles, Japanese brushes, - markings on the painted surfaces are taken from early Chinese writing. 2017. Miniature woven basket beads, pine needles, Japanese paper, hand painted, two glass beads. 2017. Vessel woven in exposed pine needles, Japanese brushes, – markings on the painted surfaces are taken from early Chinese writing. 2017.
ohn McQueen's extraordinary works have been described as "hovering, with great humor, in the gap between craft, sculpture and Conceptual art...His virtuoso craftsmanship and the conceptual underpinnings of his work merge to remind us that skill is subservient to meaning in artwork that nourishes both the eye and the intellect." 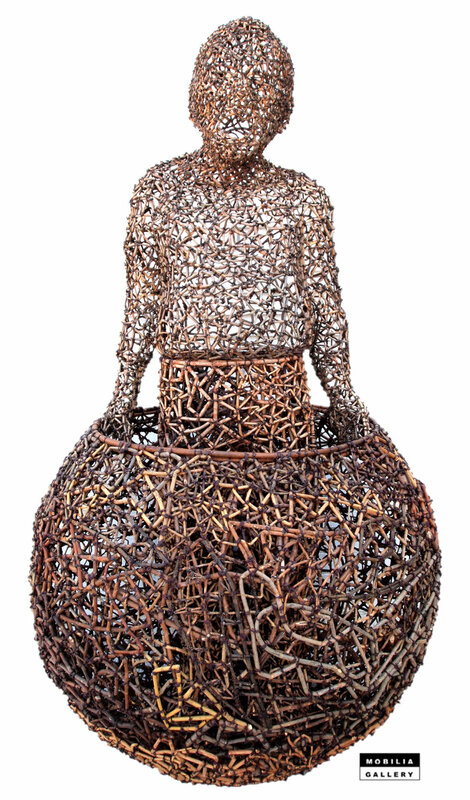 - Gerald Mead His sculptural forms acknowledge the rich tradition of basketry by manipulating organic materials such as bent, tied and woven willow branches, harvested from his own property. Richly textured and layered wall pieces are expertly transformed into figurative images or narratives from layers of colored birch bark found on the forest floor. McQueen masterfully discovers the potential of any substance, awakening our awareness to natural materials that are usually ignored and often discarded. These remnants are deftly constructed with a myriad of textile techniques, incorporating ancient art forms with contemporary issues and concepts. 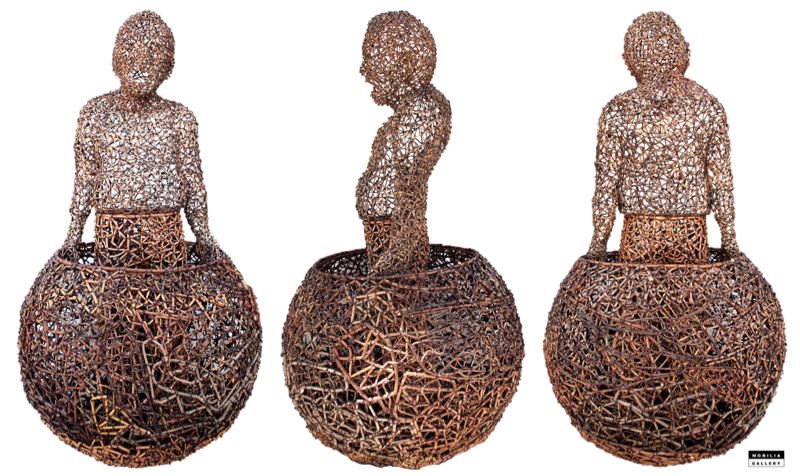 Each object is transformed into a unique and vibrant work of art with imagination, wit and brilliant execution. His work can be found in the numerous permanent collections including Cooper-Hewitt Museum, Smithsonian Institution, New York, NY; Museum of Arts & Design, New York, NY; Museum of Fine Arts, Boston, MA; Philadelphia Museum of Art, Philadelphia, PA; Racine Art Museum, Racine, WI and Renwick Gallery, National Museum of American Art, Smithsonian Institution, Washington, DC. Mary Bero’s intimate, decorative fiber works combine embroidery techniques with painting, drawing and sculptural elements to create primitive explosions of vibrant color and emotion. Bero weaves what she has called “tapestry paintings.” Her primary technique is to hand-stitch cotton or silk thread or floss to a cloth backing, simultaneously building up areas of color and texture that form striking images and patterns when seen together. She sometimes augments these methods with acrylics, cloth, or paper. Mary Bero is a two-time winner of the National Endowment Fellowship for the Arts. Lanny Bergner is a mixed-media sculptor, installation, fiber and sculptural basketry artist, creating organic constructions out of manmade materials By using hands-on processes of coiling, fraying, twisting, wrapping, gluing and knotting, he transforms bronze, brass, aluminum and stainless steel screening, wire, silicone, monofilament and glass frit into "other worldly" constructions. "My aim is to bring the natural/artificial and man/nature together into an assemblage of forms that appear to have, grown into being. I love the natural world and am constantly inspired by its beauty and varieties of form. This, in combination with my fears, quirks and joys, results in works that celebrates the mystery and wonder of it all". His work is in numerous museum collections including the Seattle Art Museum, Seattle, WA, Museum of Art and Design, NY, NY, Fuller Craft Museum, Brockton, MA, and The Central Museum of Textile, Łódź, Poland. In 1995 he won the Betty Bowen Memorial Award, administered by the Seattle Art Museum. In 2005 he won a Gold Prize at the Cheongju International Craft Biennale in Cheongju, Korea and was invited to create an installation “Between Earth and Sky” at the 2007 Cheongju International Craft Biennale. "I want to become a link in that long chain of human activity, the patterning of cloth on any surface available. I have learned from many cultures and pay homage to them. My work is pretty much autobiographical and narrative. It records my travel – anything I see or experience can pop out in my work, the connection being most often intuitive." Katherine Westphal influenced a generation of textile artists, including Lia Cook. She became a pioneer in pursuing new avenues of textile printing and image generation - including the use of the office Xerox copy machine, and heat transfer on both cloth and handmade paper.In 1966 she agreed to teach a design class for one quarter at the University of California, Davis. She stayed, became a tenured faculty member in 1968, and turned a design appreciation class that no one wanted, into one enrolling 300 students each term, with ten assistants working with her. She became a full professor in 1975 and retired in 1979, honored as Professor Emeritus, as well as the honor of being awarded a Fellow of The American Craft council. "My current practice incorporates concepts of cloth, touch, and memory. I use the detail, an intimate moment in time, often woven in oversize scale to intensify a shared emotional and sensual experience. I use a digital loom to weave images that are embedded in the structure of cloth. The digital pixel becomes a thread that when interlaced with another becomes both cloth and image at the same time. This woven image brings with it many of the sensual experiences that we associate with cloth. Childhood family snapshot and video stills are some of the raw materials that I draw on to investigate small, intimate details of the body or to capture a fleeting human expression My practice involves research into new technologies and new ways to translate my images that make the structure visible and physically felt, attempting to create the image as physical object." Public Collections include: Museum of Modern Art, New York, New York; Museum of Arts and Design, New York, New York; De Young Museum of Art, San Francisco, California; Renwick Gallery, National Gallery of American Art, Smithsonian Institution, Washington, D.C; Denver Art Museum, Colorado; Museum of Fine Arts,Boston, Massachusetts; American Association for the Advancement of Science, Washington D.C.
Ulla Stiler meticulously covers everyday objects with cross stitched needle point fabric. The scenic needlepointed views are artfully fabricated and placed on chairs, phones, binoculars, etc... transforming them into vibrant works of art. Her pieces often highlight elk, deer or birds placed in an idyllic woodland setting, keeping the essence of the piece, bringing new life to a sculptural form, showcasing its functional design. "The shelves of my studio are packed with books — art history books, volumes of mythology, religious texts, early editions of Aesop’s Fables — manuscripts filled with the stories humans have recounted since ancient times as they tried to make sense of their world. Creation stories, tales of journeys and quests, parables of good and evil — these are the stories that find their way into my work, not as specific narratives, but as references to the connections between people across continents and centuries. Mythology and art have been intertwined for as long as there have been humans on earth, and my work often explores this connection. Art history is a continuing theme and appears in references to Persian miniatures, Norse manuscripts and Medieval bestiaries. Without Saints is based on Benozzo Gozzoli’s 1459 painting, Journey of the Magi. My fiber process also has ancient roots. Coiling is a simple basketry technique, so deeply embedded in history that no one is certain when it first began. Though it is traditionally used to make vessels, I construct a myriad of forms, including sculptures, installations, and wall works. My pieces are complex, but the technique is simple, requiring only a threaded needle." A celebrated innovator, Renie Breskin Adams explores her dreams and personal history through colorful and humorous stitched narratives. Her works are in the collections of The Art Institute of Chicago, IL; Helen Louise Allen Textile Collection, University of Wisconsin-Madison, WI; Museum of Fine Arts Boston, MA; Renwick Gallery of the Smithsonian Institution, Washington, D.C. among many others. Her work is selected for the current Collection Focus at the Racine Art Museum. "People sometimes ask, 'Why do you stitch?' or 'Why don't you just paint?' Connections to textiles in my daily life make fiber materials very real to me and inherently meaningful. As a child I sewed, crocheted afghans, and made rag dolls. I like the aggressive colors and textures of fabrics. I am aware of the clothing on my body, and it feels good. Every morning when I ride my exercise bike, I look sideways and enjoy the pattern formed by the edges of my clothes hanging in the open closet. I look down and see my oriental rug, always an inspiration. I am inspired by narrative tradition in textiles--rugs, quilts, and ceremonial cloths which are meaningful both for their pictorial content and as useful objects. I like to experience a work of art as an object not only as an illusory image. I think of a traditional painting as a facade and the fabric behind it as merely an unseen armature. I think of my embroideries as objects with a front and a back, threads aggressively engaging and surrounding fabric, a visible process, intense and intimate, essential to the meaning of the image." Printmaker Hannah Smith hand-draws line art using photographs of tree branches in nature. The Demaines make archival prints of this art, and hand-fold them along circular creases, causing the paper to form into a natural equilibrium. Erik Demaine and Martin Demaine are a father-son math-art team. Martin started the first private hot glass studio in Canada and has been called the father of Canadian glass. Since 2005, Martin Demaine has been an Artist-in-Residence at the Massachusetts Institute of Technology. Erik Demaine, also at the Massachusetts Institute of Technology, is a professor of computer science. He received a MacArthur Fellowship in 2003. In these capacities, the Demaines work together in paper, glass, and other material. They use their exploration in sculpture to help visualize and understand unsolved problems in science, and their scientific abilities to inspire new art forms. Their artistic work includes curved origami sculptures in the permanent collections of the Museum of Modern Art (MoMA) in New York, and the Renwick Gallery in the Smithsonian. Their scientific work includes over 60 published joint papers, including several about combining mathematics and art. The Demaine's also won a Guggenheim Fellowship (2013) for exploring folding of other materials, such as hot glass. Willow and wax linen. Torso attached. We invited masters in their field and emerging talents to create extraordinary pieces using traditional techniques and materials, which are often combined with contemporary technology. 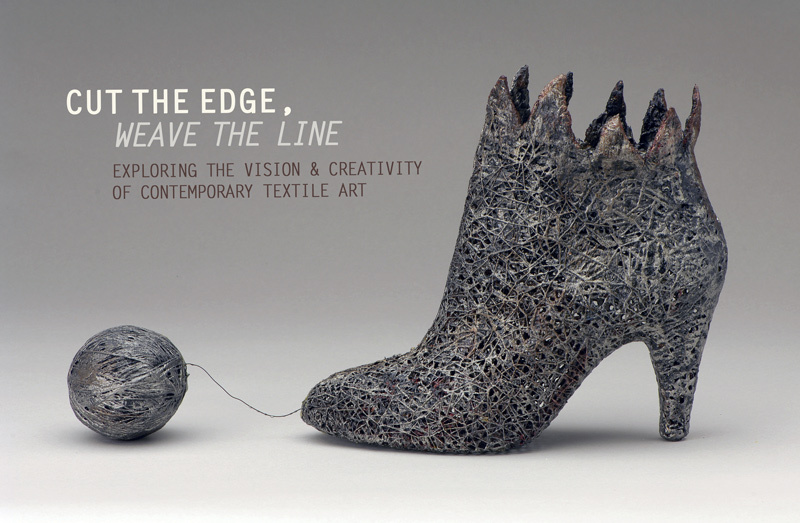 The invited artists continually explore the various perceptions and possibilities of what a textile can be. Partial Artist Listing:Lanny Bergner, Mary Bero, Lia Cook, Carol Eckert, Eleanor McCain, John McQueen, Donna Rhae Marder, Norma Minkowitz, Sophie Munns, Yoriko Murayama, Elizabeth Whyte Schulze, Polly Sutton, Ulla-Stina, Andrea Uravitch and Katherine Westphal. © 2016 Mobilia Gallery, Inc. All rights reserved.